CHICAGO -- A white Chicago police officer who shot black teenager Laquan McDonald 16 times last year was charged with first-degree murder Tuesday, hours before the city released a video of the killing that many people feared could spark unrest. Protests began soon after the video was made public, and those angry at the incident largely heeded the calls of family and community leaders to remain peaceful, despite a handful of arrests. The question now is whether those efforts will be enough to address the simmering resentment that authorities took more than a year to share the footage and charge the officer who emptied an entire magazine into the teen even after he had crumpled to the ground. Police officer Jason Van Dyke, 37, a 14-year veteran of the force, turned himself in earlier in the day. City officials and community leaders have been bracing for the release of the police dashboard-camera video, fearing the kind of turmoil that occurred in cities such as Baltimore and Ferguson, Missouri, after young black men were slain by police or died in police custody. A judge had ordered that the recording be made public by Wednesday. Moments before it was released, the mayor and police chief appealed for calm. "People have a right to be angry. People have a right to protest. People have a right to free speech. But they do not have a right to ... criminal acts," Police Superintendent Garry McCarthy said. 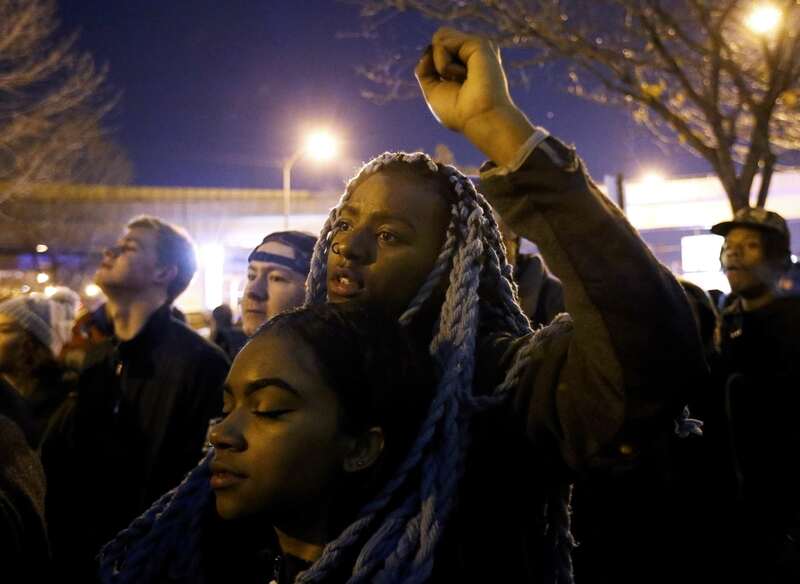 The family of Laquan McDonald, 17, also called for calm. Lawyers issued a statement on their behalf sahying, "No one understands the anger more than us but if you choose to speak out, we urge you to be peaceful. Don't resort to violence in Laquan's name." Shortly after the video's release, protesters began marching through city streets. Several hundred people blocked traffic on the near West Side. Some circled police cars in an intersection and chanted "16 shots." Chicago police said Wednesday they arrested five protesters during the overnight demonstrations. The five people were charged with offenses including assaulting a police officer, weapons possession and resisting arrest. One of those arrested was 38-year-old Dean M. Vanriper of Murrieta, California. Police say he had a stun gun and a knife. A 22-year-old Chicago man, Malcolm London, was arrested and charged with aggravated battery of a police officer. Police say he struck an officer during one protest Tuesday night in downtown Chicago. The officer was treated for injuries that weren't life-threatening and released. "I'm so hurt and so angry," said Jedidiah Brown, a South Side activist and pastor who had just seen the video. "I can feel pain through my body." Groups of demonstrators, at times numbering in the hundreds, marched through streets in the downtown and near South Side areas, gathering at one point outside the police department's District 1 headquarters. The biggest group had mostly dissipated by 11 p.m., with a few dozen returning to the District 1 building. Another group of at least 50 people briefly blocked a busy expressway before walking toward a lakefront park. A few yelled at police officers, others chanted as they blocked a street. The relevant portion of the video runs less than 40 seconds and has no audio. CBS News correspondent Dean Reynolds reports that officer was a Van Dyke partner, who had told Van Dyke to hold fire when he saw Van Dyke reloading. Police have said the teen had a knife. Cook County State's Attorney Anita Alvarez said Tuesday a 3-inch knife with its blade folded into the handle was recovered from the scene. City officials spent months arguing that the footage could not be made public until the conclusion of several investigations. After the judge's order, the investigations were quickly wrapped up and a charge announced. Father Michael Pfleger, who took part in the protests, asked CBS Chicago, "Why did it take a year for Anita Alvarez to come out and the feds still haven't come out?" "It's unacceptable," he continued. "You can't ask people to trust the system if the system is broken and the system isn't working. Servin should have been fired, this guy should have been indicted 13 months ago." Alvarez defended the 13 months it took to charge officer Jason Van Dyke. She said cases involving police present "highly complex" legal issues and that she would rather take the time to get it right than "rush to judgment." Van Dyke "went overboard," she said. "He abused his authority. And I don't believe the force was necessary." But she insisted she had made the decision "weeks ago" to charge Van Dyke and the video's ordered release did not influence that. "This is a panicky reaction to an institutional crisis within the criminal-justice system," said the Rev. Jesse Jackson, a leading civil rights activist who said he hoped to see "massive" but peaceful demonstrations. The city's hurried attempts to defuse tensions also included a community meeting, official statements of outrage at the officer's conduct and an abrupt announcement Monday night that another officer who has been the subject of protests for months might now be fired. Van Dyke, who was denied bond on Tuesday, was the only officer of the several who were on the scene to open fire. Alvarez said the officer emptied his 9 mm pistol of all 16 rounds and that he was on the scene for just 30 seconds before he started shooting. She said he opened fire just six seconds after getting out of his vehicle and kept firing even though McDonald dropped to the ground after the initial shots. Van Dyke's attorney, Dan Herbert, maintains his client feared for his life and acted lawfully and that the video does not tell the whole story. Correspondent Reynolds notes Van Dyke said McDonald had lunged at him, but the video shows him moving away from Van Dyke. Van Dyke, stripped of his police powers, has been assigned to desk duty since the shooting. Herbert said the case needs to be tried in a courtroom and "can't be tried in the streets, can't be tried on social media and can't be tried on Facebook."